P.J. Gruetzmacher, CEO and President of LAI International has been elected to the SME SMART Manufacturing Tiger Team Task Force. While the term, Tiger Team, originated at NASA, and the most famous instance is undoubtedly the Apollo 13 Tiger Team, the term is now applied to a highly skilled team of specialists who come together to complete a specific project. In this case, a Tiger Team has been formed to help determine SME's leadership strategy to unify the manufacturing industry around compliance and certification for Manufacturing 4.0. As noted in previous issues, LAI International has been in the forefront of the Manufacturing 4.0 movement and has been creating and implementing several of the best practices in this area. We are honored to have our Chief Executive on the Tiger Team to help shape what Manufacturing 4.0 would mean to the industry as a whole. Mike Koesling, LAI’s Vice President of Engineering and Business Development will be presenting “MFG 4.0 Journey and our Factory of the Future” at the Smart Manufacturing Seminar Series taking place at the Center for Manufacturing Innovation in Greenville, S.C., on Oct. 25 and in Chicago, IL, on Nov.15. Presented by dynamic technology experts and innovators, the Smart Manufacturing Seminar Series enlightens manufacturers about current innovations, challenges and trends. The diverse audience represents several growth industries, including automotive, aerospace, defense, industrial machinery, and more. LAI International will share insight about how the company gained immediate payback from its implementation investment by embracing the Digital Transformation Movement, while at the same time adding elements of Manufacturing 4.0 to the toolbox of processes. These days most of the focus is on leveraging providers that specialize in turnkey factory solutions. Unfortunately, this method can be quite costly for small companies. LAI International has taken a different approach to understanding the elements that make up the factory of the future, and has been implementing incremental pieces to achieve operational gains sooner. Once a business case that makes sense is created, more facets are added to our operations. We are looking forward to sharing our small company’s journey into Manufacturing 4.0. Our goal is to help similar-sized companies envision the benefits they can achieve, including improving their factory's efficiency and providing a better overall experience for customers. Held in Chicago, IMTS 2018 was the 32nd edition of the premier manufacturing technology show in North America. The show hosted record breaking numbers of exhibiting companies (2,563) as well as attendees (129,415), attracting buyers and sellers from 117 countries! This was LAI’s first time exhibiting at the show. Our prime space was located within the waterjet and laser section of the 1.4 million square feet of exhibit space. We also featured other technologies including Electrical Discharge Machining-both wire and plunge, 3/4/5 axis machining, welding, fabrication, electro chemical machining and additive manufacturing. We spoke with many interested visitors from all over the world curious about the additive products we had on display, acquiring many leads to follow-up with in solving these potential customers’ complex problems. 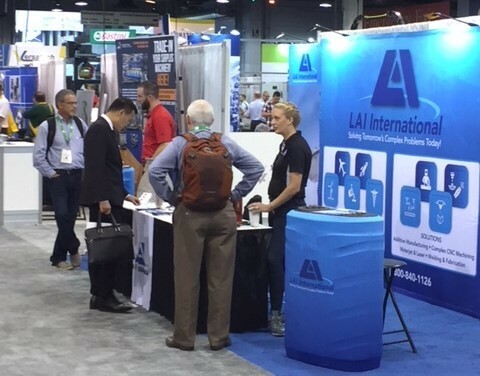 We enjoyed having the opportunity to educate many college students about what LAI does for the aerospace, defense, medical, specialty melting, and automotive markets with our technologies. They left with a little more knowledge about our approach to manufacturing as we incorporate Manufacturing 4.0 into our culture and operations. In previous years we sent engineers to IMTS to see what new technologies are out there, and to learn how we might leverage new capabilities to help our customers continue to solve their complex problems. By exhibiting at IMTS 2018 we were able to share what we currently do. We left the show with more knowledge about what the new trends in manufacturing are and gained a new appreciation for the importance of following industry trends, making sure we are advancing our company’s capabilities to keep pace with manufacturing changes.